New York (AFP) - US shares sank more than 2.0 percent Thursday with the Dow dropping to its lowest level for 2015 as worries spread about the strength of the world economy. The broad-based selloff capped a day of sharp falls from Asia to Europe, as concerns mounted that China's slowdown would drag on global growth. 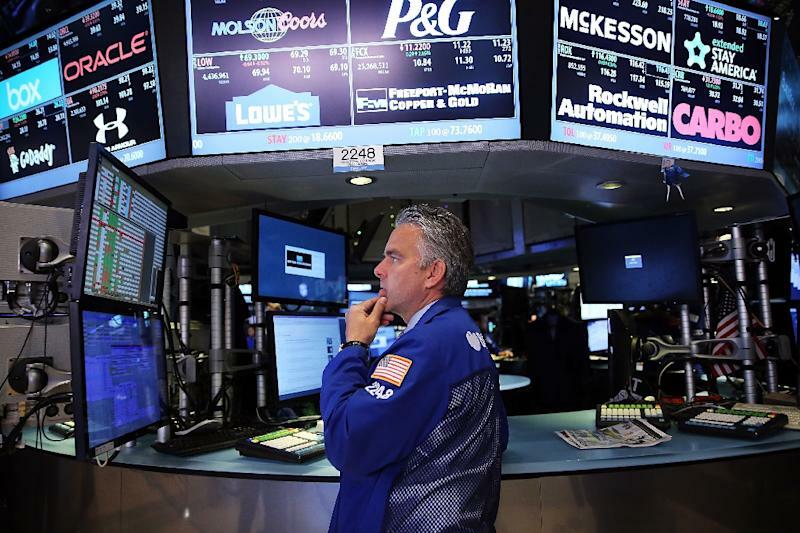 The Dow Jones Industrial Average finished down 358.04 points (2.06 percent) at 16,990.69. The broad-based S&P 500 dropped 43.88 (2.11 percent) to 2,035.73, while the tech-rich Nasdaq gave up 141.56 (2.82 percent) at 4,877.49. The Dow sank below its previous low for the year, 17,164.95 on January 31, pulled under in part by a tough downgrade of entertainment giant Walt Disney by analysts at broker Bernstein Research. Disney shares tumbled 6.0 percent, sucking others in the sector with them: Netflix (-7.8 percent), Twenty-First Century Fox (-4.2 percent), Viacom (-5.7 percent), DreamWorks (-5.4 percent) and CBS Corp (-5.1 percent). Banks also suffered, with Bank of America off 4.2 percent, Morgan Stanley 3.4 percent and JPMorgan Chase 2.5 percent. In top tech stocks, Apple fell 2.1 percent, Facebook 5.0 percent and Amazon 3.2 percent. During the session Twitter shares shrank below their 2013 IPO price of $26 for the first time, going as low as $25.92, but ended exactly on the IPO mark, off 5.8 percent. Peter Cardillo of Rockwell Global Capital said the selloff could mark the start of "a full-blown correction... for the reasons we all know about." He pointed to "oil prices continuing to go down, weaker economic global activity -- and that's obviously stemming from China." Evidence for that could be seen elsewhere among the Dow blue chips, with, after Disney, the biggest losers Merck (-4.5 percent) and Boeing (-4.0 percent). Bond prices rose. The yield on the 10-year US Treasury fell to 2.07 percent from 2.20 percent Tuesday, while the 30-year dropped to 2.75 percent from 2.86 percent. Bond prices and yields move inversely.